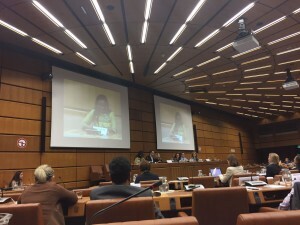 Spaces for Change’s executive director, Victoria Ohaeri, shared the findings of the organization’s research on closing spaces for civil society in Nigeria at the Financial Action Task Force (FATF) Private Sector Consultative Forum held at the United Nations Office of Drugs and Crimes in Vienna, Austria. Nonprofit organizations (NPOs) including the civil society have witnessed increased regulatory restrictions to their charitable operations across the globe. Although the restriction of civic spaces is usually framed around the objective of protecting national interest and security, it is often triggered by a number of international regulations and treaties that governments have either ratified or submitted to its implementation. An example is the Financial Action Taskforce (FATF) Recommendations, handed down by the global body that sets the standards for combating money laundering (ML) and financing of terrorism (FT). In compliance with these standards, countries have rolled out several laws and policy measures, applicable to corporate persons which have had the effect of imposing greater regulatory obligations on them, including incorporated non-profits. NPOs working in different jurisdictions, have as a result, faced increased scrutiny and legal constraints, shrinking the spaces for both charitable work and civil society operations. Evidence from across Africa, particularly in Kenya, Ethiopia, Sierra-Leone and Nigeria point to the determination of states to increase regulatory pressure, which continues to close the spaces for civic action and engagement. In 2016, SPACES FOR CHANGE launched a systematic inquiry into Nigeria’s legal regime for combating money laundering and financing of terrorism in order to gauge the effectiveness of their implementation, highlighting where high risks remain or where implementation could be enhanced. Through a digital crowdsourcing process that began in November 2015, the inquisitorial developed a database of closed spaces, profiling 97 incidents of the overbroad application of official measures against ML and FT or policies enforced in furtherance of national interest and security. Individuals, communities and organizations that are predominantly targeted are those advancing goals and advocacy consistent with civil society promotion and organization. Presentations and analytical commentaries from FATF leadership, governments, local and international non-governmental organizations provoked discussions around the lack of involvement of NPOs in the decisions taken by governments derived from FATF guidelines and priorities. Particularly interesting are the coincidences regarding the non-inclusion of CSOs on FATF processes at the international, regional and local levels. In this regard, NPOs advocated for the participation of diverse types of civil society organizations, not only the ones signaled under risk. For example inclusión of coalitions, advocacy organizations, networks and think-thanks would be important additions. The FATF visit to Nigeria (pre-evaluation visit that scheduled to hold in March 2017) has been postponed. After this initial FATF visit, Nigeria and FATF will jointly determine the date for evaluation. This includes an objective assessment of national frameworks, mechanisms and institutions for combating money laundering and financing of terrorism, as well, opening a dialogue with national authorities. Outreach with the NPO sector is part of the process, but organizations whose activities are at risk of higher abuse are accorded greater priority. Most NPOs left the meeting, perceiving a degree of openness from the FATF secretariat to receive the recomnendations and opinions from global advocates and stakeholders. Overall, there may not be explicit linkages between fulfilment of treaty obligations and the national legislative attempts to regulate the civic space. But that does not mean the linkages are illusory or non-existent. On one hand, there is evidence that the plethora of legislative efforts to restrict the civic space flows from poor understanding and overzealous implementation of international regulations. On the other hand, while the FATF Recommendations, for instance, have not been expressly mentioned in any of the legislations proposed for the regulation of NPOs, domestic efforts to comply with these international standards may have opened the door for human rights abuses, providing the government with further grounds to crush dissent and impose restrictions on civil society. To the hundreds of advocates and millions of people that benefit from non-profit activities, strategic collective action is needed to mobilize a shift in the perceptions and narratives that aim to criminalize and delegitimize charitable activities, consequently, exposing them to recurrent restrictive policies and regulations that undermine the impact and reach of their work.